Unlike eBay, which banned the sale of replicas like this (though they keep appearing), Proxibid does little to remove these items from its portal. What good is the “Report this Item” link if auctioneers persist in selling these abominable fakes? We reported the item, and Proxibid alerted the auctioneers’ sales rep. That, it seems, is as much the company can do (and we appreciate that). But if auctioneers persist, the lots remain. All an unhappy buyer can do is come to his senses and dispute the fake as significantly not as described. How many will go through that procedure when months or even years after the fact they are informed about the authenticity of the replica? What we cannot understand is how auctioneers would rather lose a major buyer like us to continue to sell these replicas that have plagued coin collecting since the 19th century when the U.S. government cracked down on them. We have been sounding the alert on these fakes on Proxibid for more than three years. This is our most popular post, which enjoys 100+ hits per month. For a more in-depth article, click here. For an in-depth article featuring quotations from top numismatist Ron Guth, president of PCGS CoinFacts, click here. For those buying and selling small denomination gold coins, PCGS CoinFacts is indispensable. It contains a regularly updated, comprehensive list of authentic types with photos to identify variety and value. We recommend that Proxibid require sellers to list the “BG identification number” for small denomination gold coins. The “BG” refers to Walter Breen and Ron Gillio, authors of California Pioneer Fraction Gold. That book is pricey ($300); best to get a subscriptiuon to CoinFacts. If you cannot find the BG number, you most probably have a fake. If you see a bear on the reverse, you have a fake. If you do not see a denomination–1/4 dollar, 1/2 dol., dollar, etc.–you have a fake or a jeweler’s token (with western scene). 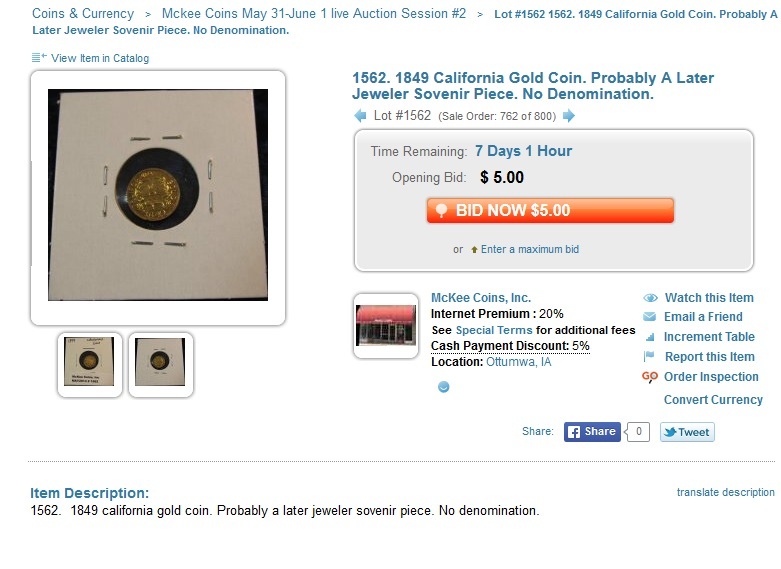 We just reported another fake on an auctioneer site from which we have bought coins in the past. If it is not taken down in a few days, we no longer will bid there as well. Reason? How can you trust an auctioneer who would rather sell a fake than take it down for a favorite buyer? 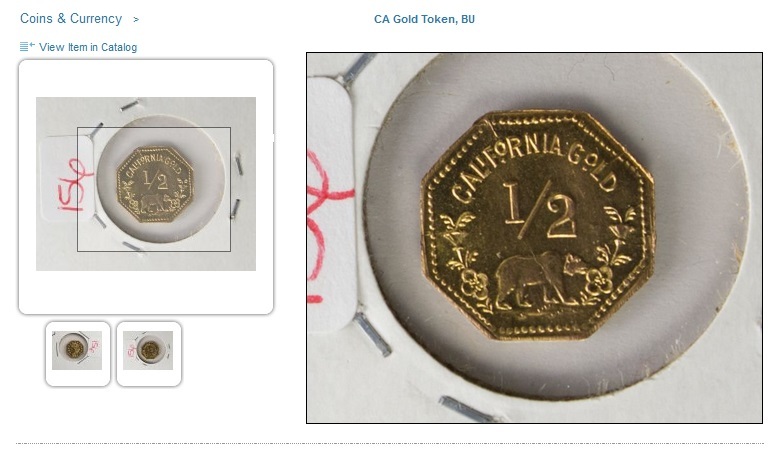 This entry was posted in Best Practices and tagged American Numismatic Association, Auctioneers, AuctionZip, Best Practices, california fake gold, california fractional gold, california replicas, Coin Auction, iCollector, National Auctioneer Association, Proxibid, Proxiblog. Bookmark the permalink.